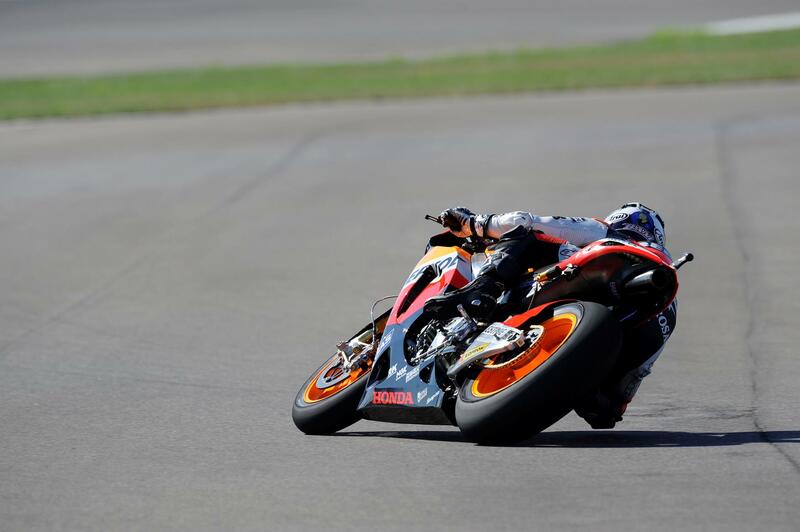 Dani Pedrosa made amends for his crash out of the lead in last year’s Indianapolis MotoGP today, the Spaniard romping to his third win of 2010 at the historic American venue. Pedrosa’s crushing victory never looked in doubt once he disposed of the fast starting Ben Spies on lap seven. Starting from fifth on the grid, the Repsol Honda rider failed to make one of his trademark quick getaways but was quickly able to seize third place from Nicky Hayden on lap two. He needed just two more laps to sweep by factory Honda team-mate Andrea Dovizioso to claim second before he embarked on a ruthless pursuit of Spies. The Monster Yamaha Tech 3 rider had made a blistering start having claimed his first premier class pole position in stunning fashion yesterday. The 26-year-old produced an aggressive first few laps to comfortably stretch away from the fast starting Dovizioso in second and on lap four he held an advantage of nearly a second over Pedrosa. But the triple world champion then produced a devastating series of laps to break Spies' dogged determination. The 24-year-old passed Spies on lap seven and immediately took out 0.6s on the reigning World Superbike champion. Spies was trying desperately to stay in contention but he simply had no answer to Pedrosa's relentless charge. The race was pretty much over as a contest on lap ten when a lap of 1.40.896 saw him increase his advantage by a second on home favourite Spies, the gap extending to nearly three seconds. Pedrosa eventually won by an easy margin of over with Spies claiming his career best result and second podium finish of his impressive rookie campaign. It was still a brilliant performance from Spies, his second place bettering his third position at the British Grand Prix at Silverstone in late June and he was top Yamaha rider for the first time in his career. That was because Jorge Lorenzo suffered his worst result of the season, the red-hot title favourite finishing in a distant third. He never looked like protecting his record of never finishing outside of the top two as a sluggish start left him fifth at the end of the opening lap. He moved by a fast fading Hayden on lap three to take fourth but he needed another nine laps to fight his way by Dovizioso into third spot. Pedrosa’s victory at least reduced Lorenzo’s huge points lead by nine-points, though the Fiat Yamaha rider still holds a comfortable advantage of 68-points with seven rounds remaining. Valentino Rossi ended a tough weekend in a lonely fourth after he’d crashed three times in total. The Italian crashed again in this morning’s warm-up session and he could never seriously haul himself into podium contention in another dull 28-lap encounter. Dovizioso was fifth but a massive 21 seconds behind Pedrosa and not one rider in the top six was within three seconds of each other. Hayden’s hopes of claiming a third successive Indianapolis podium to celebrate his new two-year Ducati contract were over early in the contest as he limped home in a distant sixth. Highlighting how uninspiring the race was, Hayden was sixth but 35 seconds behind the winner with 51 seconds covering the top ten. Aussie Casey Stoner’s winless streak continued and he’s now not won for 12 races. A shocking start left the factory Ducati ride down in ninth place at the end of lap one but he clawed his way into the top six with a pass on team-mate Hayden on lap six. But just two laps later he crashed out, once again losing the front-end of his factory GP10 while he attempted to chase down reigning world champion Rossi. Stoner’s blunder saw him surrender third place in the championship with Dovizioso’s fifth moving him seven-points clear of the 2007 world champion.